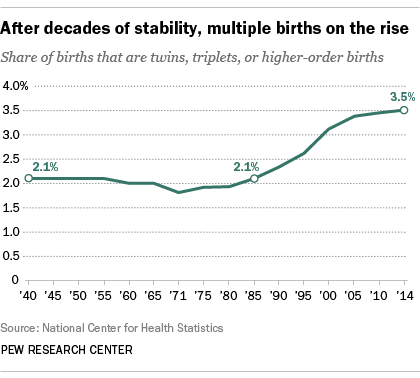 The share of multiples born in the U.S. is at an all-time high, according to recently released data from the National Center for Health Statistics. 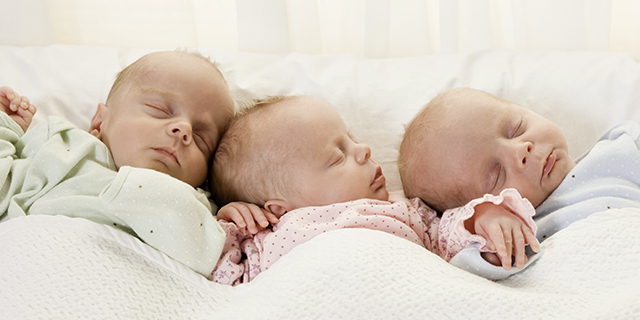 In 2014, 3.5% of all babies born were twins, triplets or higher-order multiples, accounting for almost 140,000 births. While multiples still make up a small share of all births, this marks a dramatic increase since 1915 – the first year for which reliable data are available – when about 2% of all births were multiples. In fact, the share of multiples remained quite constant for decades until the 1980s, when it started to tick up. This growing market for double strollers might reflect a shift in Americans’ lifestyles. First, as women delay childbearing into their 30s and beyond, their likelihood of having multiples – even in the absence of medical intervention – naturally rises. Second, the increasing use of fertility treatments, such as hormone therapy or in vitro fertilization (IVF), further bolsters the likelihood of multiple births. The link between a new mother’s age and the share of multiples born is striking. Among teens, fewer than 2% of all babies born are multiples, but this share rises steadily for each subsequent age group. Fully 5% of babies born to moms in their late 30s are multiples, a figure that rises to 6% for babies born to moms in their early 40s. And for women 45 and older, fully one-in-five babies are multiples. It’s worth noting that while the overall share and number of multiples is rising, there has been a decrease in births involving three or more babies. As recently as 2000, 7,300 births involved triplets or higher-order births. Today, that number stands at 4,500. Experts suggest this decline is due to improvements in artificial reproductive technology. It’s difficult to disentangle how much of the overall increase in multiples is due to aging versus technology, since older women are the most likely to use fertility services such as IVF. One analysis by the National Center for Health Statistics suggests that about two-thirds of the increase in twin births since the 1980s is related to medical interventions, while the remainder likely relates to the changing age profile of new moms. Interestingly, age is not the only demographic factor linked to the likelihood of multiples. Race and ethnicity also seem to play a role. Multiples are most common among black mothers; in fact, fully 4.1% of births to this group were multiples in 2014. 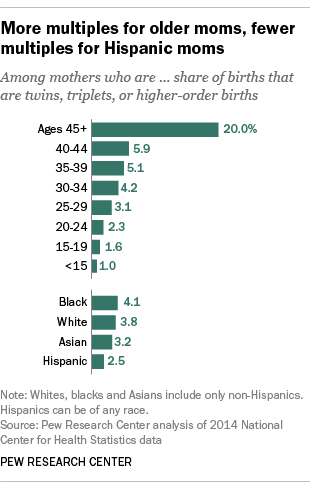 At the other end of the spectrum, about 2.5% of births to Hispanic moms were multiples. Some 3.8% of births to whites were multiples, as were 3.2% of births to Asian moms. Age is driving some of these racial and ethnic differences – for instance, white moms tend to be older, so perhaps it’s not a surprise that they are somewhat more likely to have multiples than Hispanic moms. However, that’s not the whole story. Even when examining the likelihood of multiples controlling for age, race and ethnic differences persist.